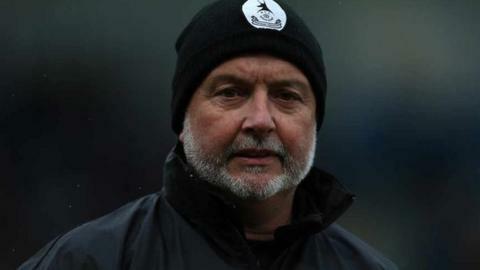 AFC Telford United boss Steve Kittrick insists he is in the job for the long haul, even if he fails to keep his side in the Conference this season. After taking over on 22 December after Liam Watson's sacking, Kittrick, 57, initially triggered a response, as Telford went five games without defeat. But since their 4-0 FA Trophy exit at Fylde, they have picked up just one point in six league matches. "You're a hero one minute. And within two weeks you're a villain," he said. "Football can be a funny game. But players make that happen. Once they step over that white line it's left to them and they've got to get on with it. "There's some good players in that dressing room. They need to ask themselves do they want to be at Telford this year and next year? "I've signed for 18 months, unless someone tells me I've signed for something different," he told BBC Radio Shropshire. "It's good to hear Steve Kittrick confirm he will be at Telford next season even if they are relegated. It's no secret that he's always had a soft spot for the club and its fans. He's determined to keep the club up and even if that doesn't happen, he'll pull out all the stops to ensure Telford bounce straight back from relegation. Kittrick is giving the current squad every chance to earn contracts for next season but, if they fail to take it, there will be big changes in the summer and quite rightly so. It's now down to the players to show the same passion and commitment." Telford are in serious danger of their second relegation back to Conference North in three seasons. They were promoted under Andy Sinton in 2011, beating Kittrick's Guiseley in the play-off final. They stayed up after their first season back in English non-league football's top flight before crashing back down in 2013 when they went a record 30 matches without a win - and went through four managers in as many months. Watson helped to stabilise the club, taking them straight back up at his first attempt, but the Telford board called time on him when the Bucks lost 16 of their first 24 Conference matches this season to fall nine points adrift at the foot of the table. With 11 games left, they are now 11 points from the safety of 20th spot. Meanwhile, summer signing Jonathan Hedge, who started this season as Telford's first-choice goalkeeper, has gone on loan to Conference North side North Ferriby United for a month - but he will not be eligible for their FA Trophy final against Wrexham on 29 March. Freddy Hall remains number one for Telford, who had trialist James Montgomery - whose great uncle is former Sunderland and Birmingham City keeper Jim Montgomery - on duty in Tuesday night's 3-1 Shropshire Senior Cup final defeat by neighbours Shrewsbury Town's Under-18s.